SOTA News 1998 SOTA Instruments Inc.
4. Units need to be designed so they won’t get hot in operation (which substantially reduces ozone output). Russ has decided to design the new unit with all these parameters in mind. In the long run it will be worth it. We wish to provide you, our customer, with the very best product. Russ has learned a great deal about ozone in the past few months. We have uncovered much mis- and disinformation regarding ozone. Ozone generation may seem simple, but there is a great deal of engineering required in order to produce the highest grade of ozone from air. We will let you know how progress is being made from time-to-time. We now provide an Arm Strap Kit for the Silver Pulser. Check out this newest accessory. 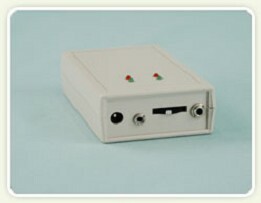 It allows the probe cords to be positioned with ease. The gold-plated electrodes on the probe cords in the kit are now a convenient 12” in length to go along with the Arm Strap Holder for the unit and the Wrist Straps. We’ve now posted a Frequently Asked Questions (FAQ’s) page. Trust you find it helpful. As a result of upgrades to the new Model MPG2, we have many used MPG1 units available. We’ve left the big city of Vancouver for a smaller town in the mountains of British Columbia. We’re now located in the breathtaking and stunning town of Revelstoke. This town of 9000 people is nestled between the Selkirk and Monashee Mountain Ranges and embraced by the emerald-coloured, glacier-fed Columbia River. Our toll free number remains the same. We’ve posted more stories from customers. Apologies for the delay in posting these but a lack of resources have prevented us from compiling them earlier. We believe you’ll find these testimonials heart-warming. Thanks for all who have taken the time and write to us. So many good people benefit from your wonderful stories. The MPG2 brings to you some of the most advanced features available: Fully automatic operation, LED light bar graph indicating charge, Switchmode Pulse-Width-Modulated power supply allows for optional 12 Volt DC operation from an automotive battery, New custom main capacitor allows for an unprecedented manufacturer rated 1/4 million (250,000) pulses. Compare with 5-10,000 pulses with camera photoflashes, or even with the 85,000 pulses of the previous MPG1 model and a lighter weight. Expect the unit to ship the first week of July, 1998. We are currently in a “sold out” position for the previous model MPG1, and we are taking orders now for the MPG2. Unavoidably, there will be a higher retail price for this new model: $250 US or $325 CDN (shipping is included in USA and Canada). As you know both the Silver Pulser and Silver Maker make Ionic~Colloidal Silver. We knew the Ionic~Colloidal Silver was amazing in its own right—as so many of you have written to us about your experience—but we also now have the following lab test results. We sent a 50mL sample of contaminated “toilet water” to the lab “SotaA sample” along with 4 more samples to which Ionic~Colloidal Silver had been added. Here’s what we got back from CanTest Ltd. Professional Analytical Services, Vancouver, BC. The results are impressive and speak for themselves. Note that the “SotaD sample” dates back to November 1997. We now wonder if indeed the Ionic~Colloidal Silver loses potency 10% daily as others have thought. At any rate the Ionic~Colloidal Silver as made with our units has a much longer shelf life. In all cases the toilet water sample was sterilized after being exposed to our Ionic~Colloidal Silver. The latest model of our Silver Pulser, the ZBB3 is ready to ship. This newest design uses higher quality parts, uses LED lights throughout, eliminates the glass light bulb, has a new thumbwheel switch for easier and more stable adjustments, includes an additional Neoprene strap, and has a new color theme. If you’ve got a previous Model ZBB, upgrade options are available. Call us at 1.800.224.0242 for more details. The Consumer Health Show was a great success. It was so nice to see many of our current customers at the Whole Life Expo. And the testimonials from people who came to our booth throughout the weekend were heart-warming.